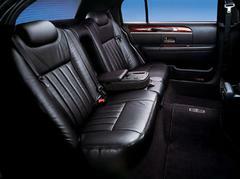 The Lincoln "L" Series luxury sedan is our signature vehicle. You'll find our sedans parked curb-side at The Calgary Airport 'round the clock for your convenience. They're also a great choice for your Dinner Transfer or evening out on the town. Luxurious, spacious and stylish, these cars also make a great impression with your coporate guests.